PixelFLEX debuted its new AR-LED technology with partner 3D Live at the LDI 2016 Conference and Tradeshow at the Las Vegas Convention Center. Billed by the company as “a true augmented reality experience,” the AR-LED video design received a positive response, and the technology is now preparing for its initial launch into the world of entertainment and commercial LED video design. Utilizing the patented lensing found in the FLEXLite series if LED panels, the new AR-LED has a 6mm pixel pitch with a broad viewing angle of 140 degrees horizontal and vertical. 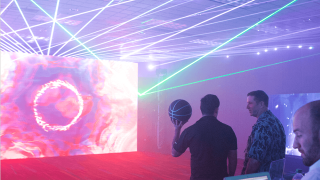 With each tile measuring 500mm by 1000mm, PixelFLEX created a 28-by-13-foot demo wall at LDI, and then added lasers to bring the full augmented reality experience to life. "While I had heard of 3D LED video screen technology before, the idea seemed very gimmicky,” said Craig Rutherford, Blueshift Design. “But walking into the PixelFLEX demo room at LDI and putting on the glasses changed all that. Used correctly, the AR-LED technology really does open up a whole new world of creative possibilities that we simply haven't seen before."